Australia's largest defence exporter has celebrated 29 years in the Australian defence industry, as it prepares to grow its Australian footprint. 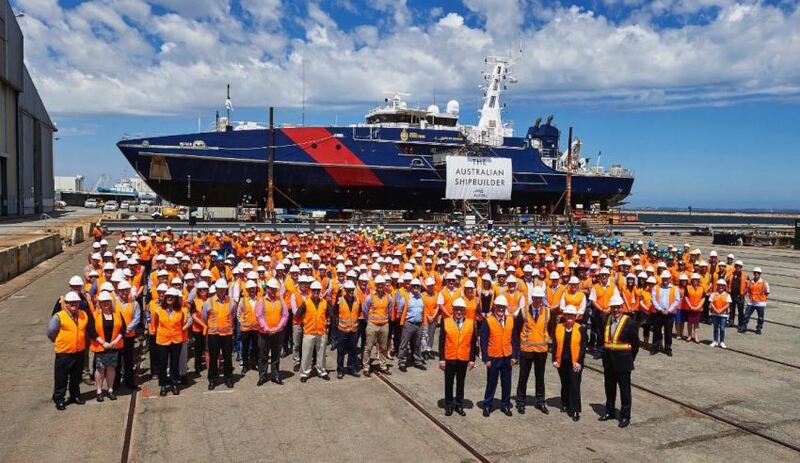 Western Australia-based Austal marked its 29th anniversary on 8 August. The Department of Defence's tabled answer to Senate estimates revealed, to date, Austal has delivered or constructed 300 vessels, 80 per cent of which has been, or will be, delivered overseas, making it Australia's largest defence exporter. "Austal has advised Defence that, since 1988, the Austal group has delivered, is constructing or has contracted 300 vessels. Of these, approximately 80 per cent or 237 vessels have been delivered to, or will be delivered to, operators outside of Australia," the tabled answer reads. "Austal's 63 Australian deliveries include the Commonwealth’s entire border patrol capability of 32 vessels for the Royal Australian Navy and Australian Border Force. Austal has delivered and continues to deliver commercial and defence vessels to more than 100 operators located in 54 countries, including 14 countries in Europe, 12 countries in Asia and 28 countries across the rest of the world." In its 29th year, Austal has established a new office in Adelaide in support of the Offshore Patrol Vessel (OPV) design and project management, and as part of its expansion plans. Defence Connect spoke with Austal's chief executive David Singleton, who outlined the plans the company has for the design office, and what this means for the $3 billion Offshore Patrol Vessel contract and commercial sales. "The reason for having a design office in Adelaide is we fundamentally believe in keeping the design people close to the build, because they're best able to help with problems and issues as you go through the build program, which inevitably you have, so it's very important to have the design people, not in the same country, but right next door to the build, and that's what we will do by having the design office in Adelaide," explained Singleton. Austal is currently partnered with German shipbuilder Fassmer for the $3 billion OPV contract, which would see the companies build 12 OPVs for the Royal Australian Navy. The company has also partnered with ASC Shipbuilding for the $35 billion Future Frigates Program, which will see the two companies pool their resources, skills and experience and act as one in support of the program. Singleton said the company's partnership with ASC will also allow Australia's shipbuilding industry to be 'export competitive'. "We are exceptionally proud of Austal’s export heritage, a record that has seen us sell more than 255 ships to 100 customers in 44 countries, including the United States. The opportunity to work with ASC Shipbuilding to bring Australia’s shipbuilding industry into an export competitive position is a game changing announcement and something we are both very excited about," said Singleton. The $35 billion Future Frigate Program will deliver replacement vessels for the existing Anzac fleet with production scheduled to commence from 2020 at the federal government-owned shipyard in Osborne, South Australia. Austal was also awarded the $306 million Pacific Patrol Boat Replacement contract in May 2016, following a competitive tender. The contract comprises the design, build and sustainment of 19 39.5-metre steel-hulled patrol boats, for 12 Pacific Island nations. Delivery of the 19 vessels is scheduled from 2018 to 2023. Sustainment of the new fleet of vessels will be carried out by Austal from a facility in Cairns, Queensland.